Download "Administrative Intern Job Description"
1 Administrative Intern Job Description Purpose: Responsible to: Supervises: Payment rate: The Administrative Intern develops building-level administrative skills by assisting the Principal and other members of the administrative team in providing professional leadership to organize, administer, and provide support for a creative school program. Principal Personnel assigned by the Principal Salary and benefits to be established by the Board of Education Qualifications: 1. Kansas teaching license and/or building-level administrative license, or currently enrolled in a state accredited building-level licensure program. 2. Minimum of three years successful experience in teaching and/or administrative and/or supervisory fields in education. 3. Special interest in professional development, curriculum, instruction and assessment, and all other aspects of educational leadership. 3. Health and Inoculation Certificate on file in the Central Office (after employment offer is made). 4. Desire to continue career improvement by enhancing skills and job performance. Essential Functions: 1. Ability to work with principal, staff and parents on strategies that assist in continuously improving student achievement and instruction. 2. Ability to assist in providing professional leadership to organize, administer, and provide support for a creative school program. 3. Ability to assist in establishing an optimal learning environment within the school. 4. Ability to ensure all school programs and activities conform to District guidelines. 5. Ability to assist in establishing a positive learning environment and respond to the individual needs of students. 6. Ability to communicate and work effectively and constructively with members of the school district and community. 2 Page 2 of 2 7. Ability to react to change and frequent interruptions in a productive and positive manner, meeting deadlines as assigned. 8. Work to implement the vision and mission of the District. 9. Ability to work with technology/computer systems especially as they relate to the teaching and learning process. 10. Ability to supervise, direct, motivate, and collaborate with the building principal to improve teaching and learning within the school/s. 11. Ability to model commitment and dedication to work. 12. Ability to work independently and without supervision, and complete work in an efficient manner. Physical Requirements/Environmental Conditions: 1. Must occasionally work in noisy and crowded environments, with numerous interruptions. General Responsibilities: 1. Ability to support the functions of the school including student discipline and other supervisory duties as assigned by the principal. 2. 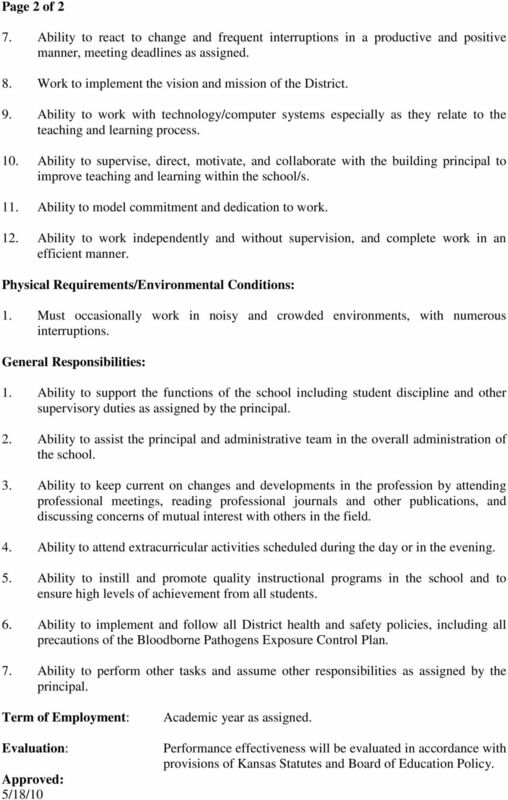 Ability to assist the principal and administrative team in the overall administration of the school. 3. Ability to keep current on changes and developments in the profession by attending professional meetings, reading professional journals and other publications, and discussing concerns of mutual interest with others in the field. 4. Ability to attend extracurricular activities scheduled during the day or in the evening. 5. Ability to instill and promote quality instructional programs in the school and to ensure high levels of achievement from all students. 6. Ability to implement and follow all District health and safety policies, including all precautions of the Bloodborne Pathogens Exposure Control Plan. 7. Ability to perform other tasks and assume other responsibilities as assigned by the principal. Term of Employment: Evaluation: Approved: 5/18/10 Academic year as assigned. Performance effectiveness will be evaluated in accordance with provisions of Kansas Statutes and Board of Education Policy. 3 Assistant Director of Special Services Job Description Purpose: The Assistant Director of Special Services assists the Director of Special Services in planning, implementation and oversight of the policies and procedures of special education and related programs. The Assistant Director works with district and building administrators to implement, guide, and evaluate programming for students with disabilities and/or exceptionalities in accordance with federal and state mandates and to support the district s mission for all students. Responsible to: Director of Special Services Payment rate: Salary and benefits established by the Board of Education Qualifications: 1. Masters Degree in School Leadership and endorsement in at least one area of Special Education from an accredited institution. 2. 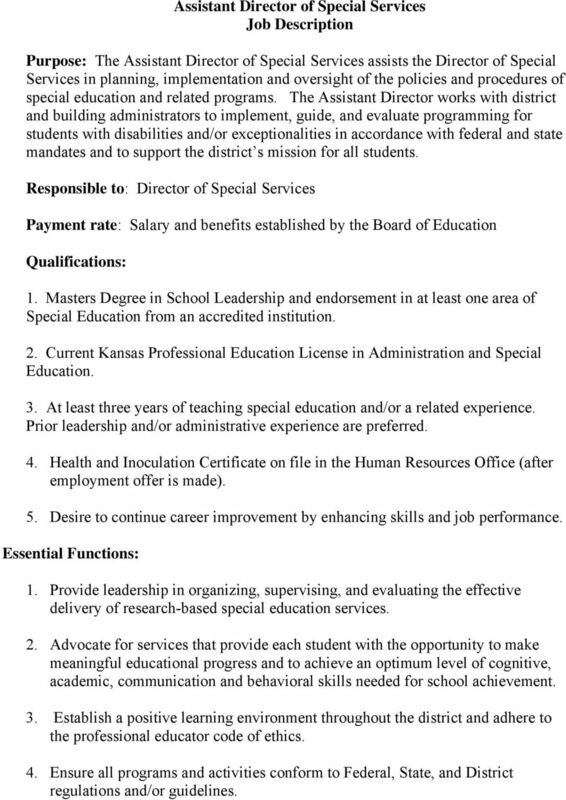 Current Kansas Professional Education License in Administration and Special Education. 3. At least three years of teaching special education and/or a related experience. Prior leadership and/or administrative experience are preferred. 4. Health and Inoculation Certificate on file in the Human Resources Office (after employment offer is made). 5. Desire to continue career improvement by enhancing skills and job performance. Essential Functions: 1. Provide leadership in organizing, supervising, and evaluating the effective delivery of research-based special education services. 2. Advocate for services that provide each student with the opportunity to make meaningful educational progress and to achieve an optimum level of cognitive, academic, communication and behavioral skills needed for school achievement. 3. Establish a positive learning environment throughout the district and adhere to the professional educator code of ethics. 4. Ensure all programs and activities conform to Federal, State, and District regulations and/or guidelines. 4 5. Communicate and work effectively and cooperatively with members of the school district and community organizations/agencies to promote a positive, instructionally effective school climate. 6. Operate equipment including technology if needed to perform assigned duties. 7. React to change and frequent interruptions in a productive manner, meeting deadlines as assigned. 8. Implement the vision and mission of the district. Physical Requirements/Environmental Conditions: 1. Must occasionally work in noisy and crowded environments, with numerous interruptions. 2. Have ability to travel in personal or school district vehicle. 3. Be flexible regarding scheduling, working conditions, and locations. 4. May require some physical exertion. General Responsibilities: 1. Provide leadership within the Special Services Department to monitor the achievement of special needs students and children and to ensure school, district, state and federal policies and procedures, i.e. IDEA and NCLB, are up-to-date and successfully implemented. 2. Analyze and interpret district/building data related to special education and while working with the Director of Special Services, use the information to align the service structure of all schools to meet the educational decisions of students with disabilities while maintaining equitable caseload/class size ratios. 3. Research, select and operationalize initiatives for the Special Services Department that align professional development, student progress, and efforts to close the achievement gap within the framework of fiscal responsibility, best practice instructional delivery, and personnel requirements. 4. Collaborate with the Director of Special Services and the Human Resources Department to assist with interviewing, hiring, orientation, evaluation, and professional growth/improvement planning of Special Services staff. 5. Assist with professional development regarding best instructional practices for students with special needs, including co-teaching, differentiated instruction, and successful inclusion. 5 6. Collaborate with district and building administrators to select instructional and curricular materials and resources to support student learning. 7. Co-coordinate scheduled meetings with related services providers within the Special Services Department to promote departmental and district priorities, staff collaboration and professional expectations. 8. Serve as the Special Services Department s representative for committee work related to Multi-Tiered System of Support, Positive Behavioral Supports, Student Improvement Teams. 9. Assist the Director of Special Services in collecting, analyzing and reporting student data related to state and district assessments. 10. Remain up-to-date regarding current special education state and federal laws and regulations and ensure administrative and instruction staff are informed of, and acting in compliance with the latest requirements. 11. Collaborate with Director of Special Services to review significantly challenging student needs, assist teams to reach consensus, and provide support to building teams working to facilitate appropriate interventions. 12. Supervise the selection of the web-based IEP resources, revise IEP compliance requirements and provide appropriate professional development related to writing quality IEPs. 13. Assist with district s effort to increase the number of practicum/fieldwork students, interns and student teachers in an effort to increase the pool of highly qualified professionals. 14. Assist the Director of Special Services in reviewing classified staff, supporting effective staff development needs, and monitoring state personnel reports for paraeducators. 15. Participate in efforts to positively promote the school district and the Special Services Department with community partners, stakeholders, parents, and patrons. 16. Attend appropriate district, local and state administrative meetings and be an active participant in school/district committees, and when appropriate, IEP and other team meetings, parent conferences, and staffings. 17. Collaborate with Director of Special Services to manage and allocate financial resources including federal and state funding and grant awards. 18. Plan for and co-supervise Extended School Year Services. 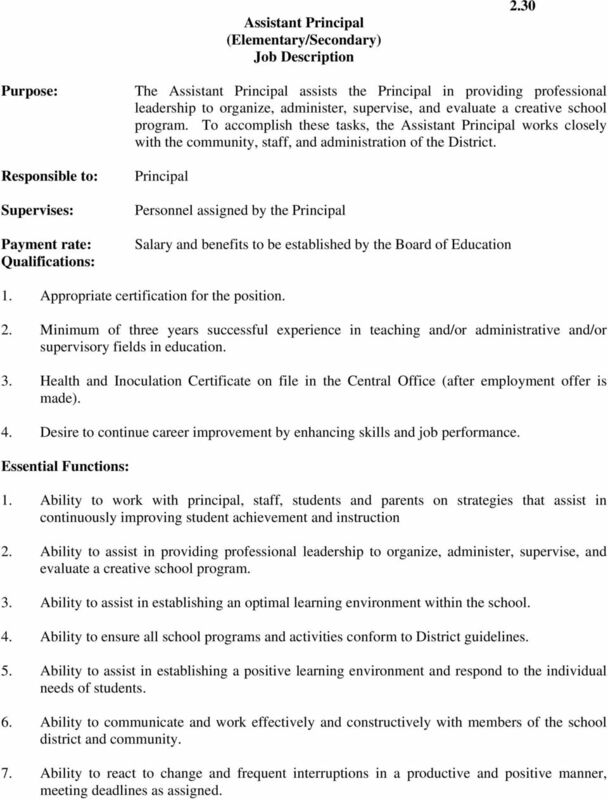 7 Assistant Principal (Elementary/Secondary) Job Description 2.30 Purpose: Responsible to: Supervises: Payment rate: Qualifications: The Assistant Principal assists the Principal in providing professional leadership to organize, administer, supervise, and evaluate a creative school program. To accomplish these tasks, the Assistant Principal works closely with the community, staff, and administration of the District. Principal Personnel assigned by the Principal Salary and benefits to be established by the Board of Education 1. Appropriate certification for the position. 2. Minimum of three years successful experience in teaching and/or administrative and/or supervisory fields in education. 3. Health and Inoculation Certificate on file in the Central Office (after employment offer is made). 4. Desire to continue career improvement by enhancing skills and job performance. Essential Functions: 1. Ability to work with principal, staff, students and parents on strategies that assist in continuously improving student achievement and instruction 2. Ability to assist in providing professional leadership to organize, administer, supervise, and evaluate a creative school program. 3. Ability to assist in establishing an optimal learning environment within the school. 4. Ability to ensure all school programs and activities conform to District guidelines. 5. Ability to assist in establishing a positive learning environment and respond to the individual needs of students. 6. Ability to communicate and work effectively and constructively with members of the school district and community. 7. Ability to react to change and frequent interruptions in a productive and positive manner, meeting deadlines as assigned. 9 Assistant Superintendent of Administrative Services Job Description Purpose: Responsible to: Payment rate: The Assistant Superintendent will assist the Superintendent substantially and effectively by providing leadership in developing, implementing, and maintaining optimal education programs and administrative services. 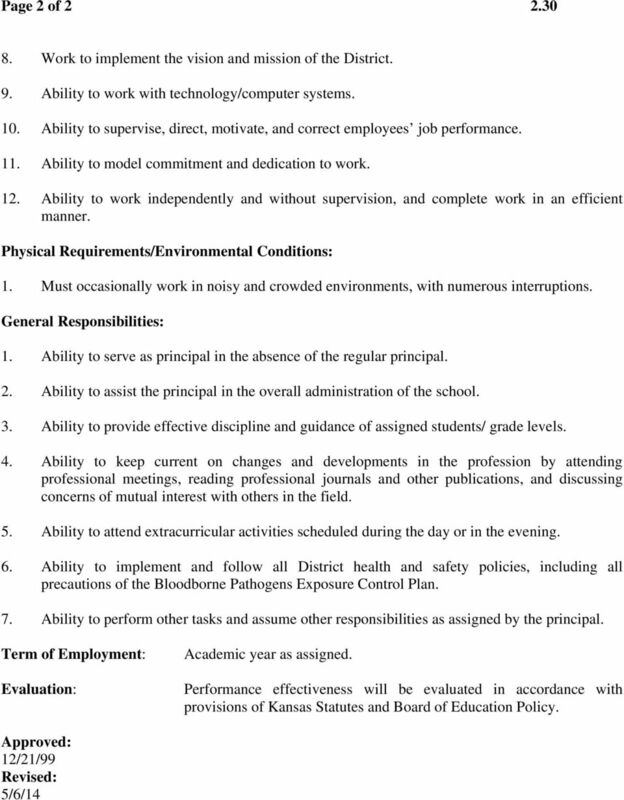 Superintendent of Schools Salary and benefits established by the Board of Education Qualifications: 1. 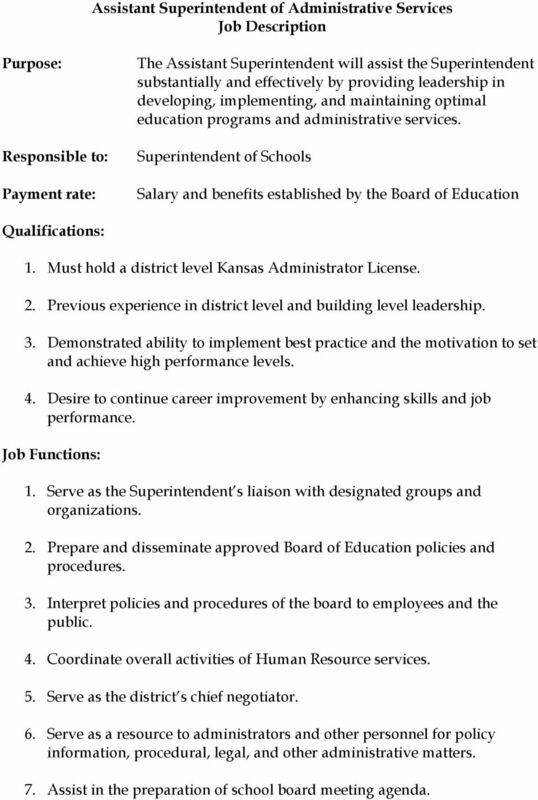 Must hold a district level Kansas Administrator License. 2. Previous experience in district level and building level leadership. 3. Demonstrated ability to implement best practice and the motivation to set and achieve high performance levels. 4. Desire to continue career improvement by enhancing skills and job performance. Job Functions: 1. Serve as the Superintendent s liaison with designated groups and organizations. 2. Prepare and disseminate approved Board of Education policies and procedures. 3. Interpret policies and procedures of the board to employees and the public. 4. Coordinate overall activities of Human Resource services. 5. Serve as the district s chief negotiator. 6. Serve as a resource to administrators and other personnel for policy information, procedural, legal, and other administrative matters. 7. Assist in the preparation of school board meeting agenda. 10 8. Compile research, statistics, and gather other such data as the Superintendent may require. 9. Conduct Administrative hearings as required. 10. Coordinate the recruitment and selection of administrative personnel. 11. 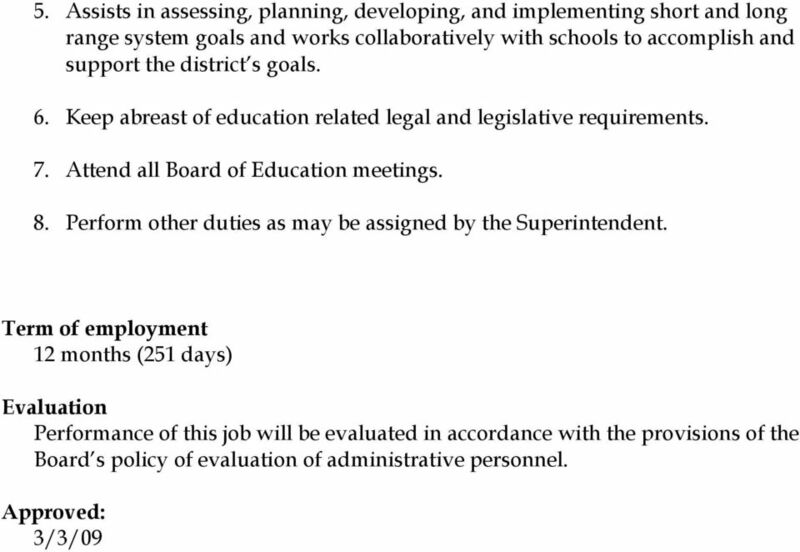 Supervise such personnel as the Superintendent may assign. 12. Report on the status of district programs and services at the request of the Superintendent. 13. Supervise teacher mentoring and new teacher induction. 14. Evaluate and assess the effectiveness of district support services and programs. 15. Ability to assist in the evaluation of building level administration. Physical Requirements/Environmental Conditions: 1. Must occasionally work in noisy and crowded environments, with numerous interruptions. General Responsibilities: 1. Prepare and disseminate approved Board of Education policies and procedures. 2. Interpret policies and procedures of the Board and other appropriate entities to employees and the public. 3. Maintains effective communication with stakeholders relative to all matters and program operations. 4. Serve as member of the Superintendent s cabinet and Administrative Leadership Team. 12 Assistant Superintendent of Business Services/Public Relations Job Description Purpose: The Assistant Superintendent of Business Services/Public Relations will: 1. Oversee the activities and operations of assigned programs; plan, manage and direct assigned functions relating to fiscal management, control and analysis; develop, control and monitor the budgets and accounts of the District; supervise and evaluate the performance of assigned personnel. 2. Collect and disseminate information about all facets of school district business. The goal is to promote the Turner Schools and education in general, and to ensure that all those having an interest in the Turner Schools are fully and accurately informed about district purposes, policies, and activities; by working closely with district staff and administration, with area news media, and with local, state, and national education agencies and professional organizations. Responsible To: Payment Rate: The Superintendent of Schools Salary and benefits established by the Board of Education Qualifications: 1. 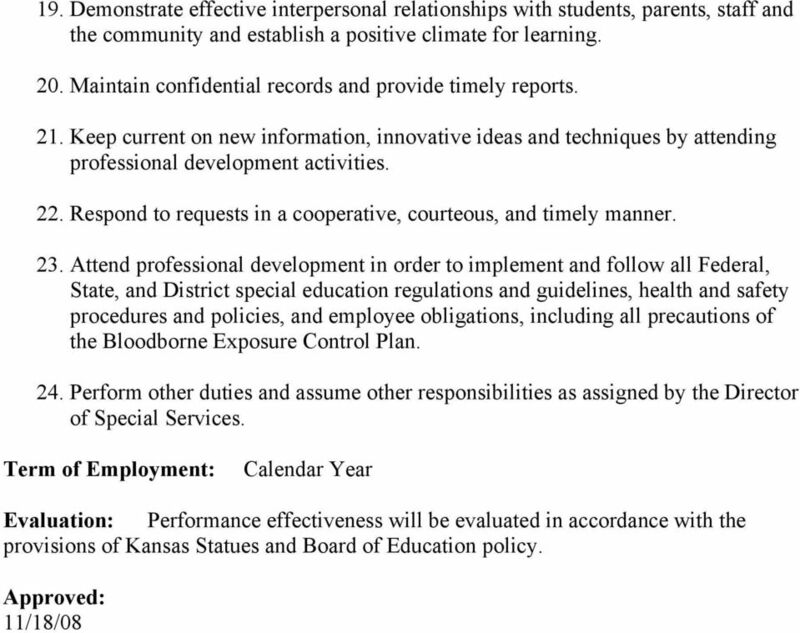 Must hold an appropriate Kansas district level administrator certificate. 2. Public school experience necessary. 3. Desire to continue career improvement by enhancing skills and job performance. 4. A minimum of 3 years experience operating a school budget. 5. Appropriate course work in Kansas school finance. 6. A degree, significant experience, and/or other evidence of outstanding professional and journalistic writing abilities. 7. Training and/or other evidence of sound, tasteful graphic design and print layout skills. 8. Advanced desktop publishing skills and knowledge of professional printing standards and processes. 9. A degree, significant experience, and/or other evidence of outstanding professional and journalistic writing abilities. 13 Essential Functions: 1. Ability to develop and administer a program for purchasing supplies and equipment. 2. 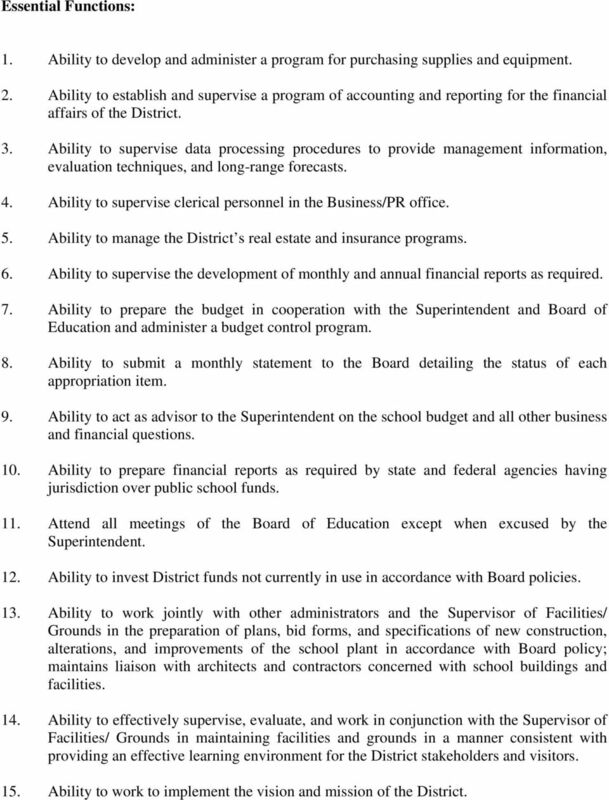 Ability to establish and supervise a program of accounting and reporting for the financial affairs of the District. 3. Ability to supervise data processing procedures to provide management information, evaluation techniques, and long-range forecasts. 4. Ability to supervise clerical personnel in the Business/PR office. 5. Ability to manage the District s real estate and insurance programs. 6. Ability to supervise the development of monthly and annual financial reports as required. 7. Ability to prepare the budget in cooperation with the Superintendent and Board of Education and administer a budget control program. 8. Ability to submit a monthly statement to the Board detailing the status of each appropriation item. 9. Ability to act as advisor to the Superintendent on the school budget and all other business and financial questions. 10. Ability to prepare financial reports as required by state and federal agencies having jurisdiction over public school funds. 11. Attend all meetings of the Board of Education except when excused by the Superintendent. 12. Ability to invest District funds not currently in use in accordance with Board policies. 13. 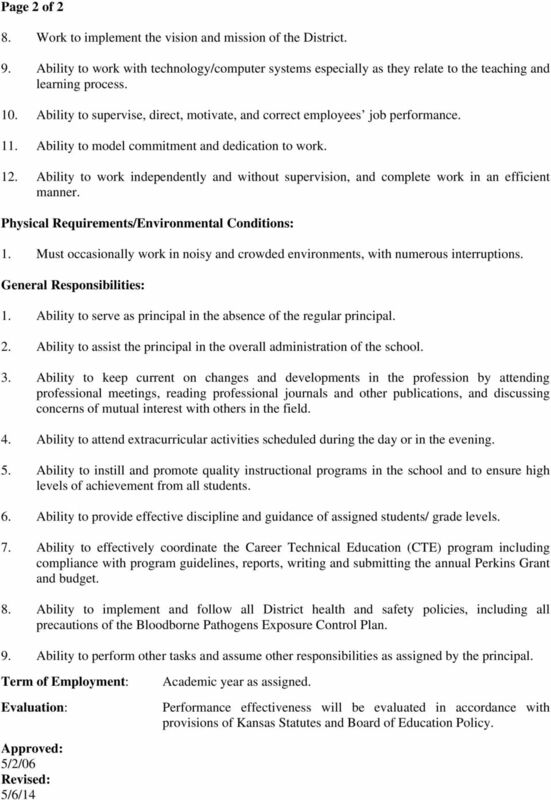 Ability to work jointly with other administrators and the Supervisor of Facilities/ Grounds in the preparation of plans, bid forms, and specifications of new construction, alterations, and improvements of the school plant in accordance with Board policy; maintains liaison with architects and contractors concerned with school buildings and facilities. 14. 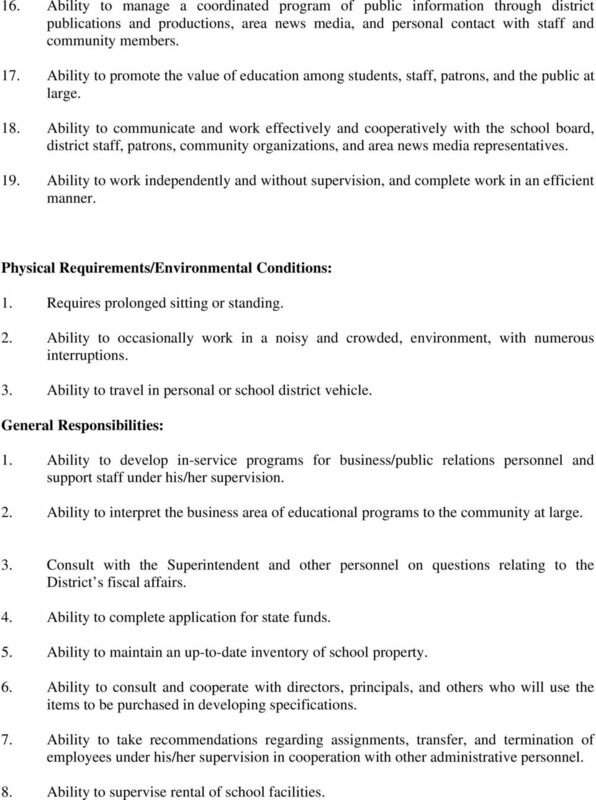 Ability to effectively supervise, evaluate, and work in conjunction with the Supervisor of Facilities/ Grounds in maintaining facilities and grounds in a manner consistent with providing an effective learning environment for the District stakeholders and visitors. 15. Ability to work to implement the vision and mission of the District. 14 16. Ability to manage a coordinated program of public information through district publications and productions, area news media, and personal contact with staff and community members. 17. Ability to promote the value of education among students, staff, patrons, and the public at large. 18. Ability to communicate and work effectively and cooperatively with the school board, district staff, patrons, community organizations, and area news media representatives. 19. Ability to work independently and without supervision, and complete work in an efficient manner. Physical Requirements/Environmental Conditions: 1. Requires prolonged sitting or standing. 2. Ability to occasionally work in a noisy and crowded, environment, with numerous interruptions. 3. Ability to travel in personal or school district vehicle. General Responsibilities: 1. Ability to develop in-service programs for business/public relations personnel and support staff under his/her supervision. 2. Ability to interpret the business area of educational programs to the community at large. 3. Consult with the Superintendent and other personnel on questions relating to the District s fiscal affairs. 4. Ability to complete application for state funds. 5. Ability to maintain an up-to-date inventory of school property. 6. Ability to consult and cooperate with directors, principals, and others who will use the items to be purchased in developing specifications. 7. Ability to take recommendations regarding assignments, transfer, and termination of employees under his/her supervision in cooperation with other administrative personnel. 8. Ability to supervise rental of school facilities. 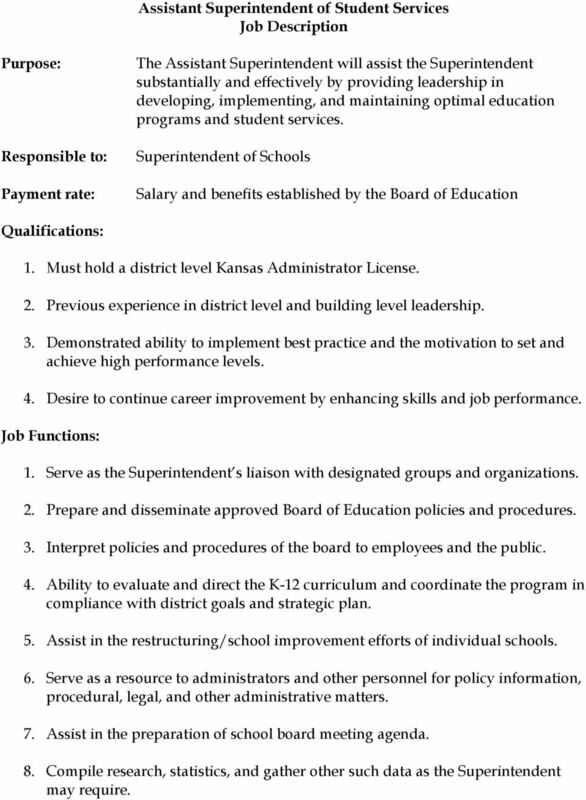 16 Assistant Superintendent of Student Services Job Description Purpose: Responsible to: Payment rate: The Assistant Superintendent will assist the Superintendent substantially and effectively by providing leadership in developing, implementing, and maintaining optimal education programs and student services. 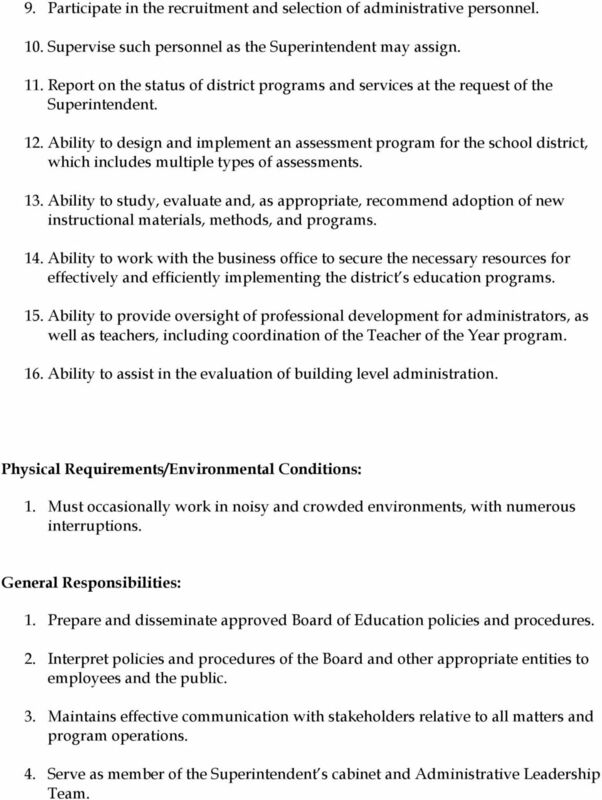 Superintendent of Schools Salary and benefits established by the Board of Education Qualifications: 1. 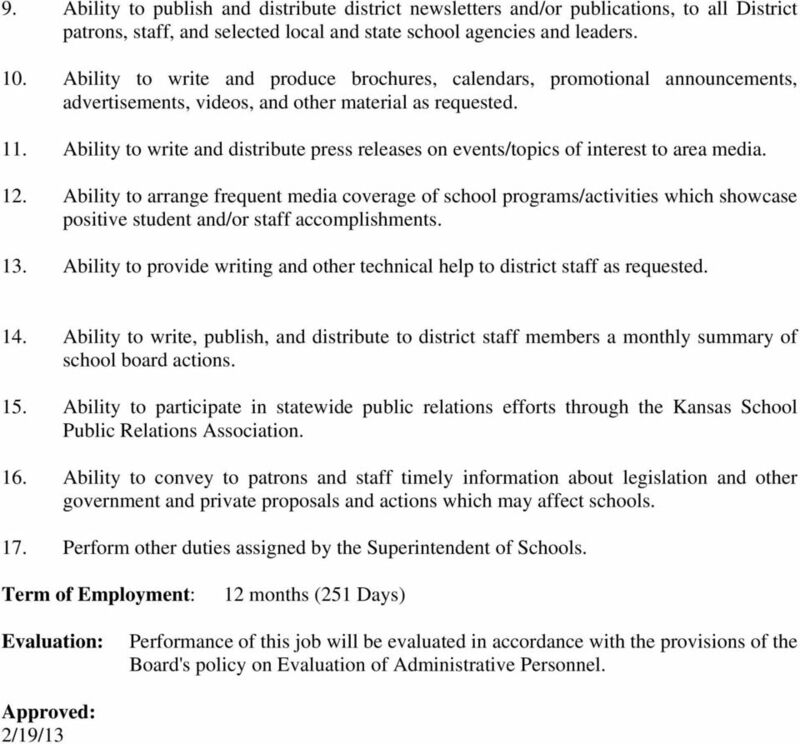 Must hold a district level Kansas Administrator License. 2. Previous experience in district level and building level leadership. 3. Demonstrated ability to implement best practice and the motivation to set and achieve high performance levels. 4. Desire to continue career improvement by enhancing skills and job performance. Job Functions: 1. Serve as the Superintendent s liaison with designated groups and organizations. 2. Prepare and disseminate approved Board of Education policies and procedures. 3. Interpret policies and procedures of the board to employees and the public. 4. Ability to evaluate and direct the K-12 curriculum and coordinate the program in compliance with district goals and strategic plan. 5. Assist in the restructuring/school improvement efforts of individual schools. 6. Serve as a resource to administrators and other personnel for policy information, procedural, legal, and other administrative matters. 7. Assist in the preparation of school board meeting agenda. 8. Compile research, statistics, and gather other such data as the Superintendent may require. 17 9. Participate in the recruitment and selection of administrative personnel. 10. 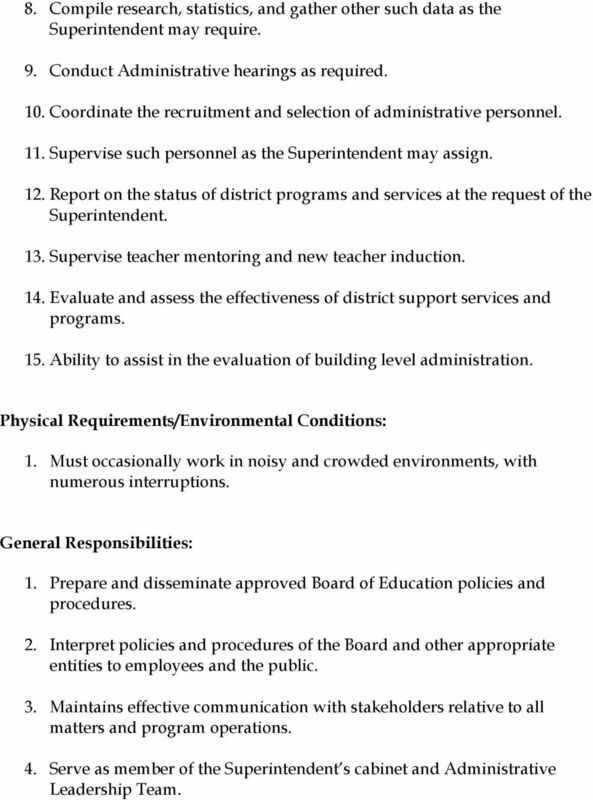 Supervise such personnel as the Superintendent may assign. 11. Report on the status of district programs and services at the request of the Superintendent. 12. Ability to design and implement an assessment program for the school district, which includes multiple types of assessments. 13. Ability to study, evaluate and, as appropriate, recommend adoption of new instructional materials, methods, and programs. 14. Ability to work with the business office to secure the necessary resources for effectively and efficiently implementing the district s education programs. 15. Ability to provide oversight of professional development for administrators, as well as teachers, including coordination of the Teacher of the Year program. 16. Ability to assist in the evaluation of building level administration. Physical Requirements/Environmental Conditions: 1. Must occasionally work in noisy and crowded environments, with numerous interruptions. General Responsibilities: 1. Prepare and disseminate approved Board of Education policies and procedures. 2. Interpret policies and procedures of the Board and other appropriate entities to employees and the public. 3. Maintains effective communication with stakeholders relative to all matters and program operations. 4. Serve as member of the Superintendent s cabinet and Administrative Leadership Team. 19 Associate Principal Job Description Purpose: Responsible to: Supervises: Payment rate: Qualifications: The Associate Principal provides the professional leadership and supervision to effectively coordinate with the building principal and district administration with a creative school program with particular attention to improved student learning through analysis of student assessment data. To accomplish these tasks, the Associate Principal works closely with the community, staff, and administration of the District. 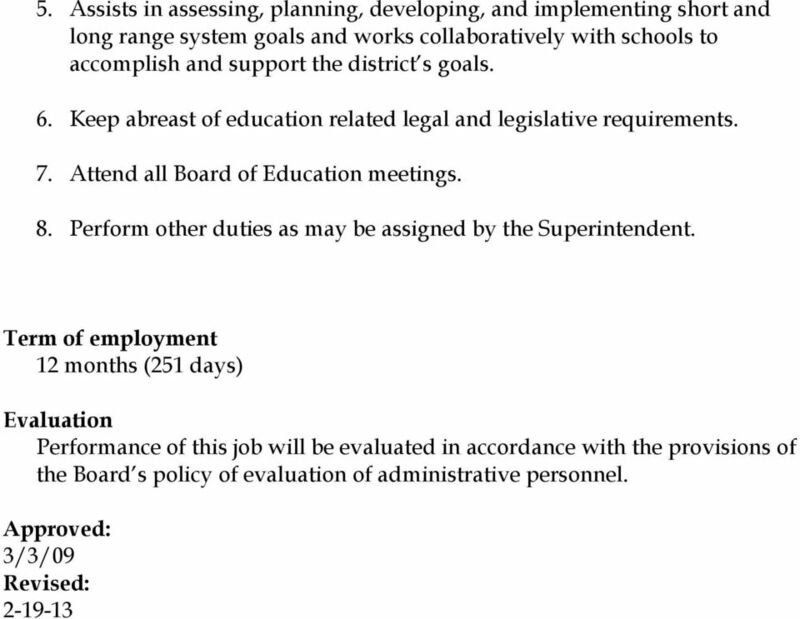 Principal Personnel assigned by the Principal Salary and benefits to be established by the Board of Education 1. Appropriate certification for the position. 2. Minimum of three years successful experience in teaching and/or administrative and/or supervisory fields in education. 3. Special interest in professional development, curriculum, instruction and assessment aspects of educational leadership. 4. Health and Inoculation Certificate on file in the Central Office (after employment offer is made). 5. Desire to continue career improvement by enhancing skills and job performance. Essential Functions: 1. Ability to work with principal, staff, students and parents on strategies that assist in continuously improving student achievement and instruction 2. Ability to assist in providing professional leadership to organize, administer, supervise, and evaluate a creative school program. 3. Ability to assist in establishing an optimal learning environment within the school. 4. Ability to ensure all school programs and activities conform to District guidelines. 5. Ability to assist in establishing a positive learning environment and respond to the individual needs of students. 6. Ability to communicate and work effectively and constructively with members of the school district and community. 7. Ability to react to change and frequent interruptions in a productive and positive manner, meeting deadlines as assigned. 21 2.10 Athletic Director Job Description Purpose: Responsible to: Payment rate: The Athletic Director coordinates school activities to avoid scheduling conflicts, ensure rewarding experiences for students, and avoid scheduling conflicts. To accomplish these tasks, the Athletic Director must work closely with the staff and administration of the District, and with the staff of other school systems. Superintendent of Schools Salary and benefits to be established by the Board of Education Qualifications: 1. Appropriate Kansas certification for the position of Athletic Director. 2. A Master's Degree, with courses in the organization and administration of athletic and physical education programs. 3. At least five years' successful experience as a head coach. 4. Health and Inoculation Certificate on file in the Central Office (after employment offer is made). 5. Desire to continue career improvement by enhancing skills and job performance. Essential Functions: 1. Ability to coordinate and supervise activities at district, league, state, and other levels. 2. Ability to ensure all school activities and conform to KSHSAA guidelines. 3. Ability to communicate and work effectively and cooperatively with members of the school district and community. 4. Ability to work effectively with booster clubs and other community organizations. 5. Ability to react to change and frequent interruptions productively and in a positive manner, meeting deadlines as assigned. 22 Page 2 of Ability to work to implement the vision and mission of the District. 7. Ability to work with technology/computer systems. 8. Ability to supervise, direct, motivate, and correct employees' job performance. 9. Ability to work independently and without supervision, and complete work in an efficient manner. Physical Requirements/Environmental Conditions: 1. Requires some travel. 2. Must occasionally work in noisy and crowded environments, with numerous interruptions. General Responsibilities: 1. Ability to prepare the athletic budget and reports. 2. Ability to formulate athletic policy. 3. Ability to hire officials for contests. 4. Ability to schedule athletic events and initiate contracts for those events. 5. Ability to purchase athletic equipment and supplies, and account for same. 6. Ability to meet with all coaches as necessary to review rules and coordinate reports. 7. Ability to certify eligibility requirements for students. 8. Ability to correspond with state athletic associations concerning eligibility requirements and interpretation of all rules governing athletic events and extracurricular activities. 9. Ability to arrange for practice sites. 10. Ability to prepare game facilities and make game arrangements. 11. Ability to arrange bus transportation for all sports. 24 2.42 Director of Instructional Technology Job Description Purpose: Responsible to: Supervises: Payment rate: The Director of Instructional Technology promotes the development of computer skills, assists teachers in using the best procedures and techniques in teaching with computers, and assists with the development of positive attitudes toward computers in education. In order to accomplish this, the Director of Instructional Technology must work closely with the staff and administration of the District. Superintendent of Schools Staff members as designated by the Superintendent Salary and benefits to be established by the Board of Education Qualifications: 1. Appropriate certification for the position. 2. Minimum of three years experience in teaching, administrative, and/or supervisory fields in education. 3. Health and Inoculation Certificate on file in the Central Office (after employment offer is made). 4. Desire to continue career improvement by enhancing skills and job performance. Essential Functions: 1. Ability to promote the development of computer skills and positive attitudes towards computers in education. 2. Ability to ensure all activities conform to District guidelines. 3. Ability to communicate and work effectively and cooperatively with members of the school district and community. 4. Ability to operate all equipment appropriately as required. 5. Ability to react to change and frequent interruptions in a productive and positive manner, meeting deadlines as assigned. 6. Ability to work to implement the vision and mission of the District. 25 Page 2 of Physical Requirements/Environmental Conditions: 1. May require some travel. 2. Must occasionally work in noisy and crowded environments, with numerous interruptions. 3. Requires prolonged sitting and standing, and use of equipment including repetitive motions and computer eye fatigue. 4. Occasionally requires physical exertion to manually move, lift, carry, pull, or push heavy objects or materials. General Responsibilities: 1. Ability to prepare reports. 3. Ability to collect, coordinate, and provide data to the Superintendent. 5. Ability to assist in adoption and maintenance of educational software. 6. Ability to work with principals and teachers to integrate related computer activities into other areas of the curriculum. 7. Ability to disseminate information on computer-related events. 8. Ability to plan and present districtwide and building-level professional development programs related to instructional technology. 10. Ability to identify materials, supplies, and equipment needed for District-wide and building-level use. 11. Ability to assist with ordering needed supplies and equipment within the designated budgets. 12. Ability to devise and maintain such records and reports as are necessary to the successful execution of the job. 14. Ability to collect and prepare public information articles concerning instructional programs for distribution to the community and media in coordination with buildinglevel administrators. 16. Ability to serve as consultant to teachers on K-12 materials requests. 17. Ability to provide resource information and assistance to curriculum review committees. 26 Page 3 of Ability to collaborate and participate in job-related meetings. 21. Ability to attend relevant professional meetings. 22. Ability to keep current on educational innovations and trends in education/technology at the local, state, and national levels. 23. Ability to observe and follow all school district policies at all times. 24. Ability to respond to information requests in a cooperative, courteous, and timely manner. 25. Ability to keep student and personnel information and records confidential. 26. Ability to implement and follow all District health and safety policies, including all precautions of the Blood-borne Pathogens Exposure Control Plan. 27. Ability to perform other tasks and assume other responsibilities as directed by the Superintendent. Term of Employment: Evaluation: Approved: Academic year as assigned. Performance effectiveness will be evaluated in accordance with provisions of Kansas Statutes and Board of Education Policy. 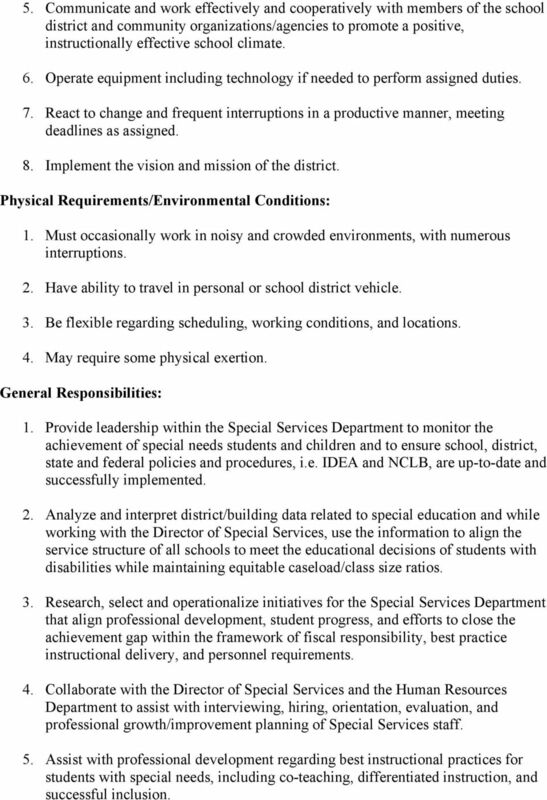 27 Director of Special Services Job Description Purpose: The Director of Special Services plans, implements and assumes oversight of the policies and procedures of special education and related programs. The Director coordinates with district and building administrators to implement, guide, and evaluate programming for students receiving special services in accordance with federal and state mandates and to support the district s mission for all students. Responsible to: Assistant Superintendent of Student Services Payment rate: Salary and benefits established by the Board of Education Qualifications: 1. Masters Degree in School Leadership and endorsement in at least one area of Special Education from an accredited institution. 2. 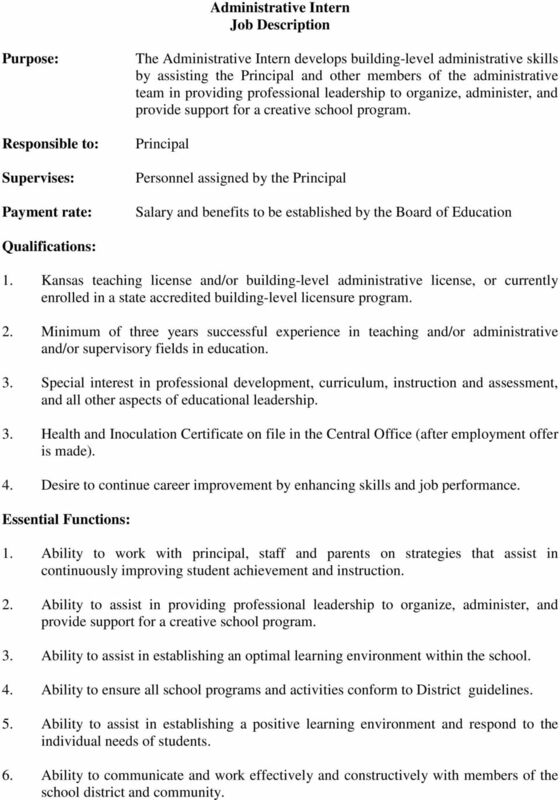 Current Kansas Professional Education License in Administration and Special Education. 3. At least three years of teaching special education and/or a related experience. Prior leadership and/or administrative experience are preferred. 4. Health and Inoculation Certificate on file in the Office of Administrative Services (after employment offer is made). 5. Desire to continue career improvement by enhancing skills and job performance. Essential Functions: Note: When Special Services are referenced in this document, this includes special education, English Language Learners, Parents as Teachers, At-Risk Preschool, Homebound, Library, 504, and School Nursing services. 1. Provide leadership in organizing, supervising, and evaluating the effective delivery of research-based special education services. 2. Advocate for services that provide each student with the opportunity to make meaningful educational progress and to achieve an optimum level of cognitive, academic, communication and behavioral skills needed for school achievement. 3. Establish a positive learning environment throughout the district and adhere to the professional educator code of ethics. 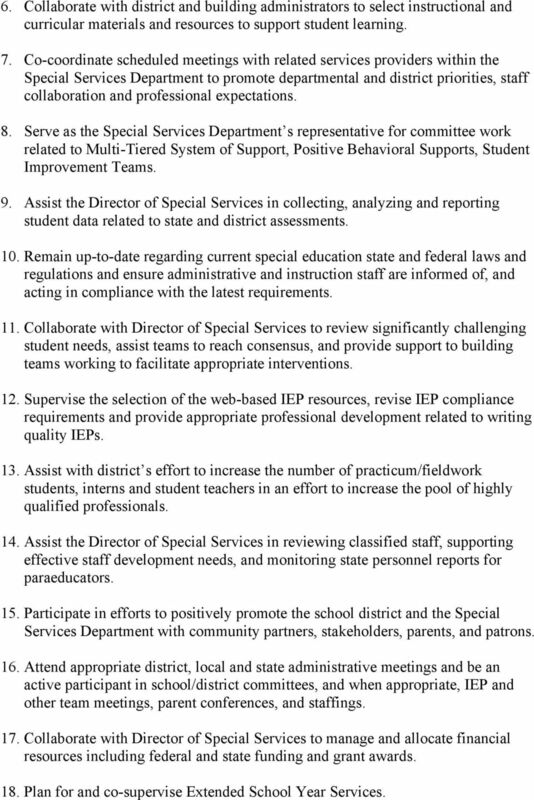 29 reporting, and other initiatives adopted by the Kansas State Department of Education. 5. Collaborate with the Business Office to develop responsible budgets for Special Services programming. 6. Collaborate with the Office of Administrative Services to recruit, select, assign, and evaluate special needs programming related staff. 7. Coordinate the delivery of services for alternative instruction, i.e. FOCUS, STEP, and Homebound. 8. Provide effective, applicable professional development opportunities to certified and classified special education staff and when applicable, to general education professionals. 9. Present or delegate periodic reports on the status of special services initiatives to the Board of Education. 10. Maintain comprehensive student records using technology whenever possible and disseminate information to teachers and parents according to laws and procedures related to student confidentiality. 11. Provide leadership in the development and evaluation of the school improvement process and set high expectations for student achievement and behavior. 12. Maintain an adequate inventory of resources and supplies to support fiscal and student achievement accountability. 13. Facilitate communication between personnel, students, parents, and/or patrons for the purpose of evaluating situations, solving problems, and/or resolving conflicts. 14. Coordinate scheduled meetings with related service providers, and special services staff to promote departmental and district priorities, collaboration and professional expectations. 15. Remain up-to-date regarding current special services state and federal laws and regulations and ensure administrative and instructional staff are informed of, and acting in compliance with the latest requirements. 16. Participate in efforts to positively promote the school district and the Special Services Department with community partners, stakeholders, parents, and patrons and whenever possible to increase the understanding of the educational needs of special needs children. 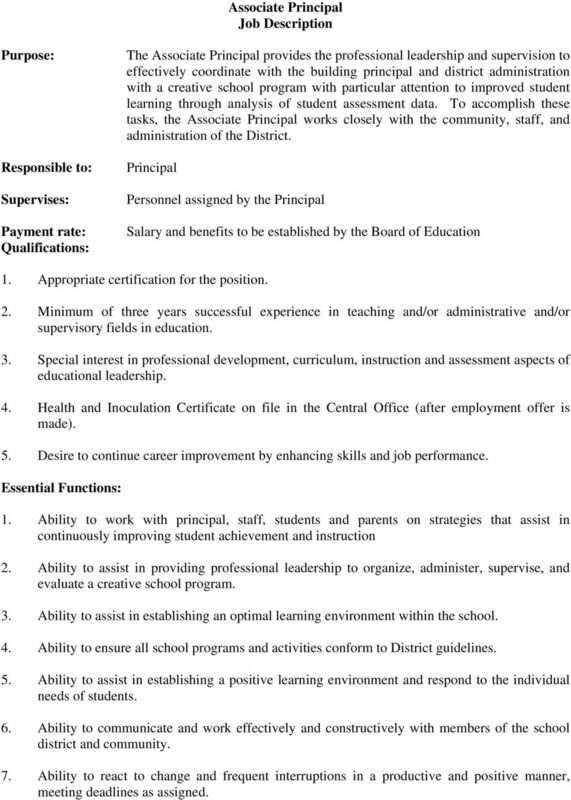 31 District Coordinator of Professional Learning Job Description Purpose: The District Coordinator of Professional Learning provides professional leadership in organizing, administering, supervising, and evaluating a high quality professional learning program for district staff. To accomplish these tasks, the District Coordinator of Professional Learning works closely with district staff, including instructional coaches, and administration of the District. Responsible to: Superintendent of Schools Supervises: Payment rate: All personnel serving in assigned school(s) Salary and benefits to be determined by the Board of Education Qualifications: 1. 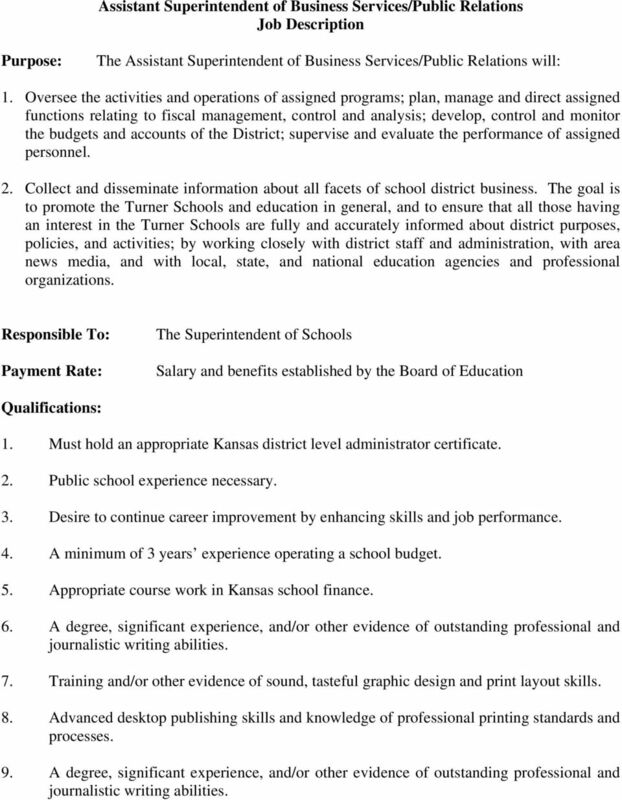 Current Kansas Professional Education License in Building Administration and District Licensure or pursuing a plan of study to obtain District Licensure. 2. Minimum of five years successful experience in teaching, Administrative and/or supervisory experience in education is desired. 3. Health and Inoculation Certificate on file in the Central Office (after employment offer is made). 4. Desire to continue career improvement by enhancing skills and job performance. Essential Functions: 1. Ability to work with students, parents, and staff, including instructional coaches and district administrators on strategies that assist in continuously improving the district professional learning program. 2. Ability to provide professional leadership in organizing, administering, supervising, and evaluating the effective delivery of the district professional development program. 3. Ability to establish a high quality professional learning program for all district staff. 32 Page 2 of 4 4. Ability to ensure all school programs and activities conform to federal, state, and District guidelines. 5. Ability to communicate and work effectively and cooperatively with members of the school district and community. 6. Ability to react to change and frequent interruptions productively and in a positive manner, meeting deadlines as assigned. 7. Ability to work to implement the vision and mission of the District. 8. Ability to work with technology/computer systems. 9. Ability to supervise, direct, motivate, and correct employees job performance. 10. Ability to model commitment and dedication to work. 11. Ability to work independently and without supervision, and complete work in an efficient manner. Physical Requirements/Environmental Conditions: 1. Must occasionally work in noisy and crowded environments, with numerous interruptions. 2. Requires some travel. General Responsibilities: 1. Ability to initiate, design, and implement programs to meet specific educational needs of all district staff. 2. Ability to supervise the professional learning program and ensure teachers are encouraged, and given opportunities to grow professionally and personally. 3. Ability to plan, organize, and direct implementation of district-wide professional learning activities. 4. Ability to participate in selecting new faculty members, including instructional coaches whose knowledge and skills are likely to be assets to a balanced, expert teaching staff. 5. Ability to program professional learning activities/ events to meet staff/ faculty needs and to take best advantage of faculty expertise. 33 Page 3 of Ability to formulate proposals for additional funding, supervise the implementation of funded projects, and maintain effective public relations with funding agencies, KSDE, and other state and community agencies. 7. Ability to establish and maintain favorable relationships with staff groups and individuals to foster understanding and solicit support for overall school, district, and professional learning programming; to interpret Board policies and administrative directives; and to discuss and resolve individual staff concerns/ problems regarding professional learning. 8. Ability to orient newly assigned staff members and assist in their development. 9. Ability to operate an ongoing program of staff development designed to help teachers stay current on developments in their fields and in education. 10. Ability to involve staff, including teachers and instructional coaches in the design and implementation of effective/ research-based strategies. 11. Ability to evaluate and counsel all staff members regarding their individual and group performance. 12. Ability to prepare or supervise the preparation of reports, records, lists, and all other paperwork required or appropriate. 13. Ability to participate in leadership meetings as required, including Superintendent s Cabinet. 14. Ability to work in conjunction with the Assistant Superintendent of Student Services regarding budgetary requests and monitor expenditures of funds related professional learning. 15. Ability to cooperate with college and university officials regarding professional learning opportunities. 16. Ability to inform faculty and staff of policy and/ or programming changes. 17. Coordinate the Professional Development Council, providing the leadership necessary to develop, create, implement, and monitor all aspects of a highly effective professional learning program.